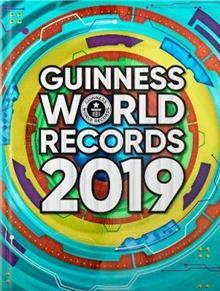 The world's most popular record book is back with thousands of new categories and newly broken records, covering everything from outer space to sporting greats via Instagram, fidget spinners and all manner of human marvels. Inside you'll find hundreds of never-before-seen photogr... read full description below. The world's most popular record book is back with thousands of new categories and newly broken records, covering everything from outer space to sporting greats via Instagram, fidget spinners and all manner of human marvels. Inside you'll find hundreds of never-before-seen photographs and countless facts, figures, stats and trivia waiting for you on every action-packed page. Guinness World Records 2019 is the ultimate snapshot of our world today. Plus, this year we celebrate the incredible Maker movement with a special feature devoted to the inventors, dreamers, crafters and creators who devote their lives to amazing record-breaking projects such as the largest water pistol, a jet-powered go-kart and an elephant-sized hamburger (think you could eat a whole one!?). We take a sneak peak into their workshops to explore these epically big builds, and ask them what inspires them to go really, really large! And if you like creating, and you like LEGO (R), then you'll love our Making History pages that use the world's most famous interlocking plastic bricks to illustrate and explain an important record-breaking object - such as the Statue of Liberty or the Apollo mission's Saturn V rocket. We examine their designs, structure and technical specifications in fully illustrated and colourful, poster-style pages. Finally, you can jump into both the making and record-breaking action with a Do Try This At Home section. Challenge yourself and your family with five fun record-breaking maker-inspired records you can attempt involving origami, balloon sculptures, ring pulls and rubber bands. Who knows, your creation might just make it into the record books! In 1951, Sir Hugh Beaver, the then managing director of the Guinness Brewery, went on a shooting party and became involved in an argument. Which was the fastest game bird in Europe - the golden plover or the grouse? He realized then that a book supplying the answers to this sort of question might prove popular. He was right! Sir Hugh's idea became reality when Norris and Ross McWhirter, who had been running a fact-finding agency in London, were commissioned to compile what became The Guinness Book of Records. The first edition was bound on August 27, 1955, and went to the top of the British bestseller lists by Christmas that year. Since then, Guinness World RecordsT has become a household name and the global leader in world records. No other enterprise collects, confirms, accredits and presents world record data with the same investment in comprehensiveness and authenticity.